Escape to The Cape at this charming vacation rental studio condo in Dennis Port! With enough space to comfortably sleep 4, this quaint Delray Beach Club condo boasts updated appliances, all of the home essentials, and the ideal location to experience some of the best beaches in Cape Cod. Walk less than a block to Glendon Beach for a day of fun in the sun. Return to the comforts of your condo each night to grill your dinner, take a dip in the pool, or simply relax on the private back patio! 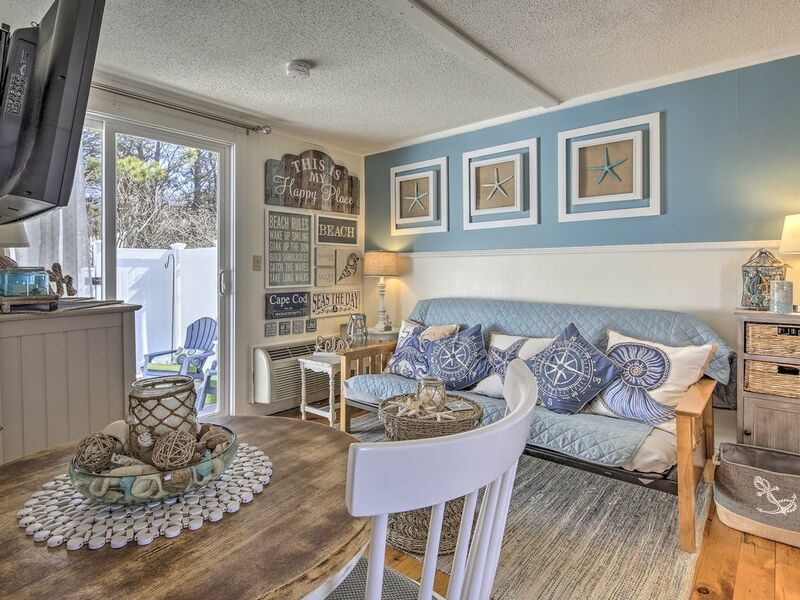 Freshly painted and decorated in beach décor, this cozy studio reminds you that you're on Cape Cod beach getaway as soon as you step inside. Open up the sliding glass door to feel the fresh ocean air or simply enjoy the sunshine that shines through the condo that creates a relaxing ambiance. The studio condo is situated in a one level building and offers a cozy, relaxed vacation retreat. With no units in front or behind, you'll have total privacy as you sit outside on the patio as you delight in pleasant Cape Cod evenings. Enjoy your morning coffee or evening cocktail as you listen to the sounds of the ocean and relax while sitting on the comfortable patio furniture. There are many fantastic dining establishments within walking distance of the property. But, there's no need to travel far when hunger strikes. Whip up your favorite meals in the well-equipped kitchen or make a barbeque dinner using the community gas grill. The kitchen has new appliances and utensils, making meal prep a breeze! After a day of fun in the sun or exploring The Cape, you're to sleep well on the new queen-sized bed or full-sized futon. Turn on the flat-screen TV and drift off while watching your favorite shows or a calming movie. A dedicated parking space adds convenience to come and go as you please, but the unit is within a half block of Glendon Beach and just a bit farther from Haigis Beach. You can also hop in your car for a short drive to other renowned beaches in the Dennis Port area including Mayflower, Constitution beaches. This condo is in the perfect location to visit all of The Cape's pristine beaches. When you're not at the beach, take the kids to The Cape Codder Water Park! This 30,000-square-foot indoor/outdoor water park provided hours and hours of fun for the whole family. Spend the day exploring some of the local nature preserves around the studio. Some great choices not far from the property include Swan River, Plashes Conservation Land, and the Sea View Park Recreation Area! Dennis Port is Mid-Cape, making it ideal for your daily excursions. Take a day to visit some of The Cape's towns like Chatham, Mashpee, or Provincetown. You'll find that each village offers its own charm! You are also near the ferries that can take you to the islands of Nantucket and Martha's Vineyard. If you're in the mood for some retail therapy, drive 9.6 miles to The Cape Cod Mall! The mall offers a variety of clothing outlets, retailers, and restaurants along with grocery stores if you need to stock up for the studio. When you want to dine out you can walk to some of Dennis Port's favorites including the Sailing Cow, Sand Dollar, Dog House followed by dessert at the renowned Sundae School Ice Cream Shop. Beachfront fine dining at the Ocean House Restaurant is a short coastal drive away. - Amenities include a well-equipped kitchen with appliances and utensils, free WiFi, new queen-sized bed, private patio with outdoor furniture, flat-screen cable TV, new curtains, air conditioning, central heating, designated parking for 1, private entrance, smoke detector, carbon monoxide detector, and much more! - Fantastic Dennis Port location just a half mile to Glendon Beach and close to a variety of other great beaches! Enjoy easy access to restaurants, Cape Cod Mall, and more! We were able to rent this condo for a lovely weekend in September to attend a Wedding that took place on the cape. It was in an excellent location as it was walking distance from the beach and just around the corner from an awesome breakfast spot. Highly recommend this condo for any couple or family with 2 children! It has a real home away from home feel! Clean, well equipped, efficient, nicely decorated. We very much enjoyed our recent stay at this efficient, clean, well thought out and very reasonably priced condo. We prepared most of our meals at the condo and found everything we needed. My husband used the gas grill that is available to everyone and was pleasantly surprised because it is in great working order. The sliding door in the back opens to a private patio, that is lovely and just a quick walk leads to the well maintained pool which we thoroughly enjoyed. It's an easy location to get around the Cape, the beach is a short walk up the street and in general it is a fun area. The owner called before our arrival, checked during our stay to make sure everything was going well, she couldn't have been nicer. We had a great time !